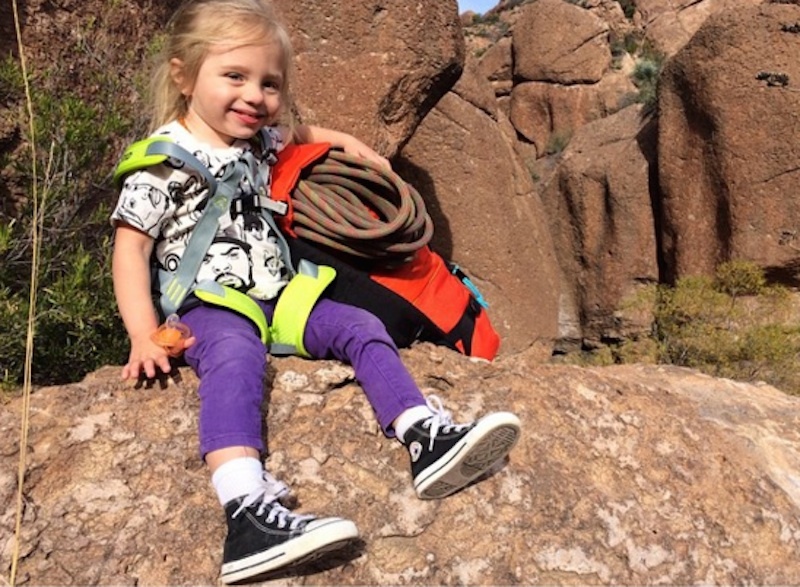 Hadlie Brechler is only four years-old, but she's already a seasoned rock climber. She has traveled to Mexico and Hawaii, but many of her outdoor adventures take place back home in Arizona where she lives with her parents, who are also avid climbers. Hadlie's mom Morgan has gained a cult Instagram following with oodles of pictures of the mother-daughter duo and various climbing companions as they climb, play, and get down and dirty in nature. While Hadlie's climbing skills are impressive, it's her family's hands-on (literally), nature-based parenting that has us envious and inspired. Mom Morgan spent her childhood years outdoors, biking and exploring the gorgeous Arizona landscape. 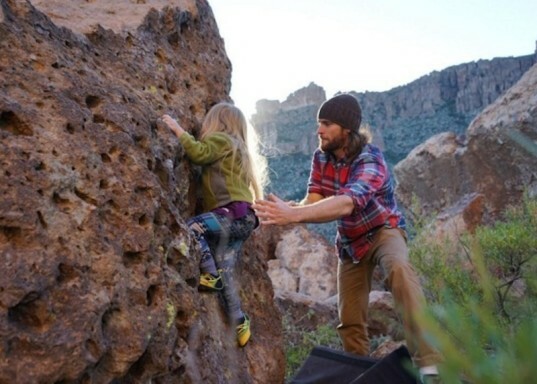 She began climbing when she met Morgan’s father and knew she wanted to spread the love of outdoors to their daughter. What she also hopes to share: a sense of self-confidence, independence, and connectedness with the world around her. Morgan describes herself as a “weekend warrior,” squeezing in family climbs amid work and school obligations, and it’s clear from her Instagram chronicles that Hadlie has caught the climbing bug. Hadlie got her first climbing experiences with mom while in a baby vest. Soon she was ready to start scaling her own rocks, always under the watchful eye and careful hand placement of her parents. Her Dad built her a climbing wall in their house for her to use as a toddler, and Hadlie also goes climbing at an indoor rock gym. Outfitted with a helmet, kid-sized harness, and other climbing essentials, Hadlie looks like any other fearless rock climber out there, albeit much younger. Morgan feels passionately about passing along and encouraging a love of nature between parents and children — and she has been an integral part of the Born Wild project, which includes a film series about adventuring moms. Born Wild also hopes to serve as a community forum to inspire parents to get outdoors. With the point of view that “risk and danger are subjective,” she and Hadlie’s dad (who is also a highline rope walker) encourage their daughter’s spirited approach to the outdoors and believe that the lessons Hadlie is learning about herself though her explorations in nature, such as perseverance and determination, will serve her well as she continues to grow. Mom Morgan spent her childhood years outdoors, biking and exploring the gorgeous Arizona landscape. She began climbing when she met Morgan's father and knew she wanted to spread the love of outdoors to their daughter. What she also hopes to share: a sense of self-confidence, independence, and connectedness with the world around her. Morgan describes herself as a "weekend warrior," squeezing in family climbs amid work and school obligations, and it's clear from her Instagram chronicles that Hadlie has caught the climbing bug. Hadlie got her first climbing experiences with mom while in a baby vest. Soon she was ready to start scaling her own rocks, always under the watchful eye and careful hand placement of her parents. Her Dad built her a climbing wall in their house for her to use as a toddler, and Hadlie also goes climbing at an indoor rock gym. Outfitted with a helmet, kid-sized harness, and other climbing essentials, Hadlie looks like any other fearless rock climber out there, albeit much younger. Morgan feels passionately about passing along and encouraging a love of nature between parents and children -- and she has been an integral part of the Born Wild project, which includes a film series about adventuring moms. Born Wild also hopes to serve as a community forum to inspire parents to get outdoors. With the point of view that "risk and danger are subjective," she and Hadlie's dad (who is also a highline rope walker) encourage their daughter's spirited approach to the outdoors and believe that the lessons Hadlie is learning about herself though her explorations in nature, such as perseverance and determination, will serve her well as she continues to grow.